It started with a trip last August to B.C. first nations along the route of the proposed Gateway project, a pipeline that would link the Alberta tar sands to a proposed shipping terminal on the West Coast. Speaking with aboriginal leaders, I got a sense that the battle over the $6-billion project will define Canada’s ethical landscape. The issue, like the people and geography, gripped me. What I didn’t realize was that my research would lead to my home and to my spiritual past. About 15 years ago, I started visiting the Hermitage, a Mennonite-run spiritual retreat centre south of Kalamazoo, Mich. I spent a number of months there over the course of several visits. The rustic guesthouse and serene woods on the 24-hectare grounds became a spiritual home for me. I encountered God on my walks through the forest. I also encountered a bare swath of land that bisected the property that turned out to be a pipeline right-of-way. Beneath the knee-high Queen Anne’s lace, oil coursed silently through Enbridge’s Line 6B. I didn’t like it, but I didn’t think much of it. 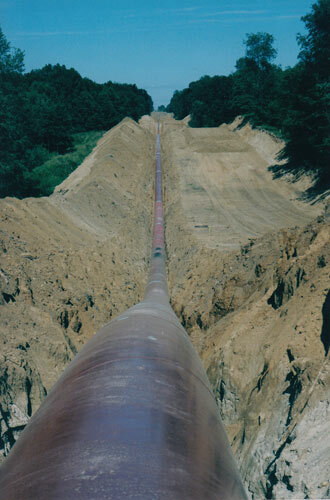 During a visit in 2000, a huge reddish pipe—a second line—lay exposed in a trench in the widened right-of-way. The defilement felt visceral. I had to leap and scramble to get to the back woods. Only this year did I realize the pipeline I had walked over and prayed over so many times in the quiet woods of Michigan—6B— is the line that so infamously spilled into the Kalamazoo River down line of the Hermitage in 2010, badly smearing the reputation of the world’s largest oil and gas pipeline company (and, ultimately, leading Enbridge chainsaws back to the woods). Soon after learning of Enbridge’s connection to my past, I learned of its entanglement in my future. After moving to a farm near Morden, Man., last fall, I realized I now live less than eight kilometres from the company’s main link to the U.S. Seven parallel lines, equivalent to a single pipe more than two metres across, flow from Alberta through the Mennonite “West Reserve” (Morden-Winkler-Altona area) to Gretna and then across the U.S. border to Chicago, the Hermitage and beyond. Each time I go to town I cross buried pipelines that can carry up to 2.5 million barrels of oil—enough to fill a train of tanker cars 60 kilometres long—every day. That’s about $200 million worth, every day. That’s more oil than all of Canada uses and about a 10th of what the U.S. uses (the equivalent of nearly five Northern Gateways). If I travel eight kilometres in a different direction, I cross another pipeline that carries an additional 590,000 barrels per day to the U.S. Built by TransCanada Pipelines in 2010, it is the forerunner of the controversial Keystone XL line. I find all this jarring. Out here in this peaceful spot on the demographic fringe of the continent flows the rich dark lifeblood of a good chunk of the North American economy. The Enbridge corridor is easy to miss, marked only by seven small signs in the ditch, but when I cross it I see in my mind an imposing neon sign flashing: “You are now crossing an artery vital to the economic machine that makes the ‘greatest of these’ über-rich and threatens to cook the future.” Global warming is, of course, the ultimate encroachment. I know that not everyone sees things this way, but, for me, these advances of Enbridge—in B.C., Michigan and Manitoba—raise a simple question: When has the encroachment of the oil industry gone too far? And how can our faith communities, which include a full range of views, discuss energy and climate change without falling into predictable ruts? In part, it was the hope of generating such dialogue that compelled me to visit B.C. The Gateway debate gives the encroachment discussion a sharp, real-life focus. The federal government, which backs the proposal, is using it as a vehicle to test drive its vision for both climate change (a lot more conventional energy) and indigenous relations (economic growth trumps all). The stakes are high and the outcome is unclear. The project has run into spirited opposition, most significantly from first nations. Not since Mohawk warriors stared down soldiers across the barricades at Oka, Que., in 1990, has our country seen this degree of aboriginal opposition to a project. Resistance is centred in 20 or so first nations between Prince George, B.C., and Haida Gwaii (formerly the Queen Charlotte Islands). 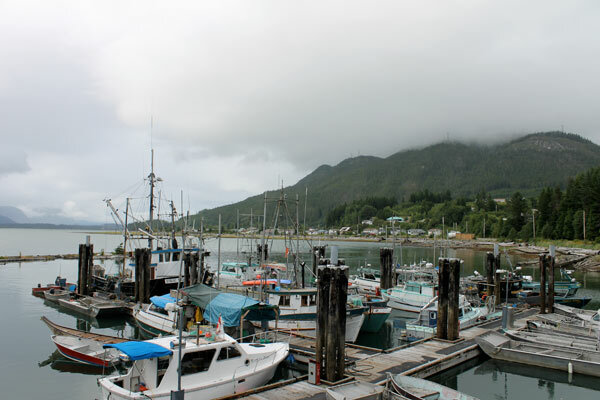 Their main concerns are the threat of a pipeline spill into one of the treasured salmon rivers and the threat of a supertanker accident along the 125-kilometres of relatively narrow passageways that ships would have to navigate before making it to the open Pacific waters. There is nothing that will make the project acceptable to them; money will not change their minds. They are prepared to go to court and stand in front of bulldozers. They don’t think the project will proceed. Given the first nations’ legal standing—they have never signed treaties or ceded rights to their lands—and given the sheer moral cost to the government of potentially arresting a significant number of respected aboriginal leaders, the prediction that the project will not proceed is not mere bravado. 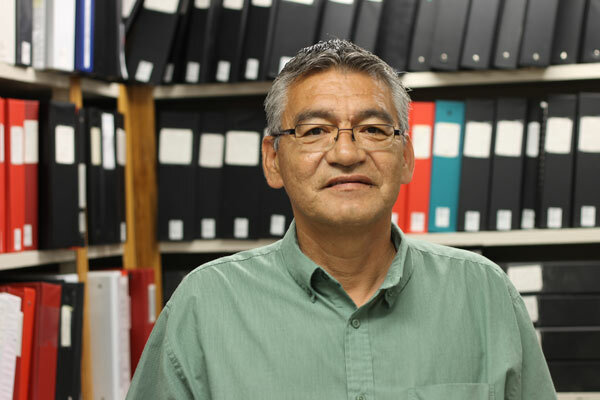 When I ask if he thinks the pipeline—which would pass through 170 kilometres of Wet’suwet’en land—will ever be built, he replies, “We are not a defeated people.” Among their victories is a landmark 20-year court battle to prove their existence. Leaders I spoke with are not opposed to development per se—the Haisla are partners in a major natural gas export project—but the level of environmental risk associated with Gateway is simply unacceptable. They have drawn a line. Many commentators expect the project to die. The advance of the oil Goliath will likely be prevented, although speculation about alternate projects is well underway. The board of the Hermitage is responding differently to the intrusion of Enbridge, which is now moving aggressively to replace and expand Line 6B. 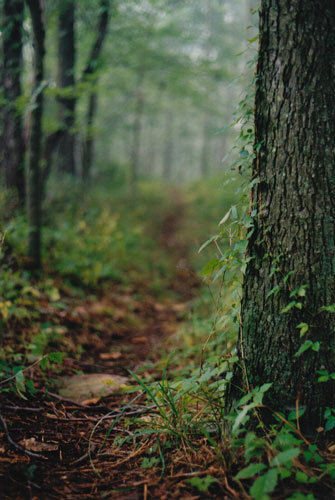 The project will require permanently widening the right-of-way across Hermitage property by 17 metres, in addition to a work easement that will be cleared but can later be replanted. After filing court papers in July to oppose the project, the Hermitage board later withdrew the petition. Hermitage co-director Naomi Wenger says, “It became really quite clear that [Enbridge] was sure of getting a permit,” and that anything the Hermitage did would simply “delay the inevitable.” Lack of resources was also a factor. Instead of fighting, the Hermitage board agreed that a service of lamentation will be held and compensation money received from Enbridge will be used for alternative energy projects. The board also stated that pipeline workers will not be vilified. Wenger’s comments lack the punch and appeal of simple resolve—like I heard in B.C.—yet I find them equally compelling. Part of me would like to see Wenger and her colleagues fight like hell to protect a place I too cherish, but they are pointing to a truth that lies beyond the impulse to fight and deeper than billion-dollar promises. Most of us are not impacted by the oil industry’s advances as directly as Naomi Wenger or aboriginal people in Northern B.C., but often the link to the industry is still close; if not as close as a nearby pipeline, then possibly as close as our investments or those of institutions we’re part of. Climate change threatens the earth. The political influence of fossil fuel companies—whose business models involve destruction of the earth—is preventing necessary change. Cut all ties to fossil fuel profits, he says. According to Fortune 500, five of the six largest companies on earth are fossil-fuel companies. Last year, their combined profits were $123.5 billion. McKibben wants investment in such companies to become disreputable, the way that holding stock in tobacco companies is frowned on in some circles. Based on polls that show support for measures to curb global warming, McKibben believes that without industry interference citizens and their governments might stand a chance to turn the climate ship around. 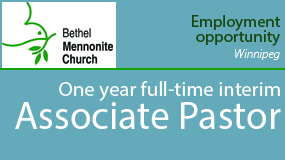 Divestment is on the Mennonite radar. Concern about Enbridge was raised at the October 2012 meeting of the Mennonite Church Canada Pension Advisory Committee, but the decision had already been made for them. Meritas—the investment firm that provides the “core option” available through MC Canada—had already dropped Enbridge due primarily to its poor environmental performance, including the Michigan spill. The decision came after three years of engagement with Enbridge management. Concern about fossil-fuel investments beyond Enbridge were also expressed at the October Pension Advisory Committee meeting, although no decisions were made. While Meritas dumped Enbridge, it is not considering general withdrawal from the fossil-fuel industry, according to Gary Hawton, president of OceanRock Investments under which Meritas operates. Meritas funds still include energy companies such as Suncor, a major tar sands player. Hawton says that if everyone divested, no one could “bring pressure from inside the boardroom,” something Meritas seeks to do. Has Meritas succeeded in applying such pressure? “I think we have in some cases,” Hawton says. People like McKibben would see little hope in those successes. Despite all we know about climate change—we’re headed straight for the point of no return—and despite the pleas from poor people in parts of the world directly affected by it, the oil industry continues its aggressive expansion. The driving rationale is the dogma of economic growth. We live in a country of tremendous abundance, yet government and industry leaders talk as though we desperately need more development. They talk not only as if limitless development is viable, but as if a dire future awaits if we reject it. An Enbridge spokesperson told me his CEO “pleaded” with aboriginal leaders to see the greater economic good of Gateway. My bet is that by the time my kids are my age—I’m cresting the hill—the dogma of economic growth will have faded. Surely at some point climate change, if nothing else, will force humanity to accept the wisdom of limits. Perhaps not. At minimum, voices questioning growth will grow louder. Will the church be among those voices? 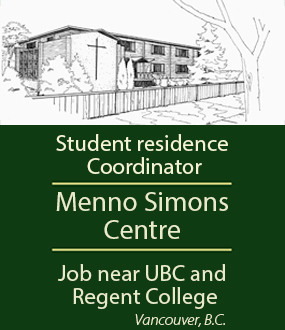 Some people within the Mennonite realm are ready to join B.C. first nations in actively opposing Enbridge and other oil encroachment. Some are reconsidering their investment portfolios. Others would surely align with Enbridge’s growth aspirations. Others still—perhaps the majority—have little space in their lives to get involved at all. Then there are the few like Naomi Wenger—perhaps the smallest group—who don’t fall neatly into any camp. She tells me about plans to build artistic prayer gardens on either side of the pipeline. Like the Hermitage itself, Wenger’s words create a sort of refuge, a space for spiritual deepening amidst real-world troubles. Perhaps that is the same sort of space—a space of affirmation and attentiveness to God—in which healthy dialogue about energy and climate can happen within the church. From 1,500 kilometres down the pipelines that connect our backyards, Wenger’s vision resonates. I too want to feel the pull of God, to feel the full sadness of encroachment, to lament together with others on an Enbridge right-of-way. I want to trust for something new, to move slowly on from oil, and finally to come through well. I suspect this approach may hold the best chance for the earth to also come through well. Thank you Will for your candidness. Thank you for a new and clear perspective. You covered all the bases on this issue. We have reached a tipping point. New oil is not needed, it is wanted by those who cannot imagine life without the perks. Fresh air and water are not perks or wants. They are needs. 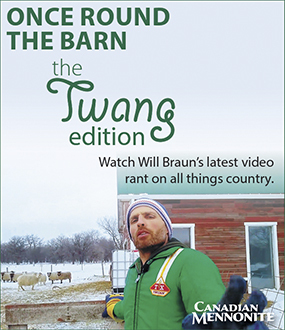 I used to sell windmill parts to the Mennonites in southern Ontario & northern New York state and I got to like them very much. Recently this magazine came onto my radar so I visit once in a while to see what's up. I have a few minor quibbles - except in his own mind Bill McKibben did not write the 'first' book on the issue, notables including Stephen Schneider were writing books about it more than a decade earlier, I don't know why he keeps making this claim, I do wonder about it - but OK. And I speak as someone who answered his call to come to Washington in September 2011 and be arrested. Very importantly, you make the connection, not just of university investments, but of pension plans generally and personal portfolios in particular, with the issue. Those who see the struggle as between some 1% and some other 99% miss this point, which is crucial to establishing both a clear moral basis for action, and ... complicity among the multitudes. I am sorry I underestimated you. I will follow more closely in future. Thank you for this.